Juice Plus Research | Wellness | Awkward; Yet Healthy. Did you know that Juice Plus is the most researched nutritional product in the world? Welp, ya do now. 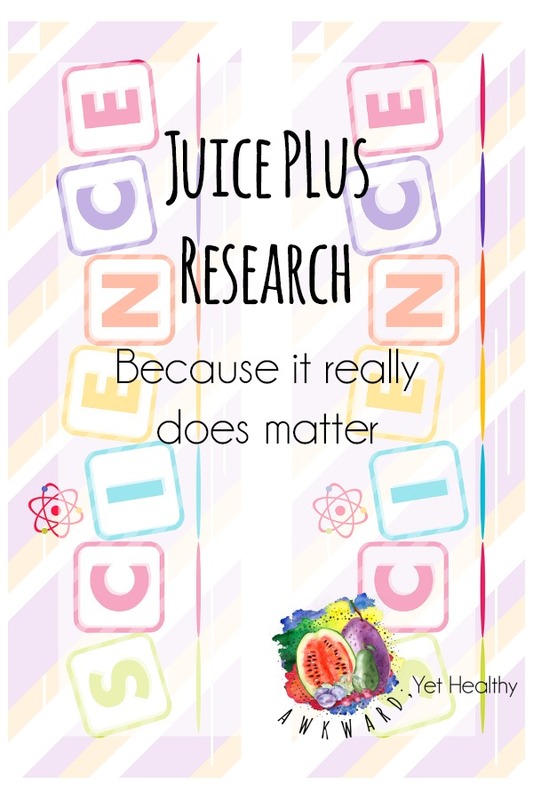 There are almost 40 PUBLISHED research studies on Juice Plus. It’s kind of a big deal. Now I know that a lot of folks out there seem to have some opinions on the research behind JP. So I want to spend a few quick minutes clearing up a few things before we dive into the actual research itself. So here’s the thing about research, anyone can do it. You’re neighbor Fred who put liquid paper on a bee, and it died, did ‘clinical research’. But to get your research published in a reputable journal or magazine? That’s a lot harder. The research is subjected to all sorts of reviews and scrutiny and only the quality stuff gets published. So ‘published’ is a key word when discussing ANY research. ‘Clinically proven’ means essentially nothing. I farted in the chair I’m sitting in, and I don’t smell anything. So now this cheap chair in the Honda waiting room is ‘Clinically proven to absorb farts’. Why does it matter who pays for it? Next up, paying for the research to be done. Did you know that car manufacturers have to pay for their vehicles to be tested to see if they meet standards? Car seats, medicine, food, oil & gas…. They all HAVE to be researched and tested. You know who pays for it? THE MANUFACTURER. I hate to burst anyone’s bubble here… but random universities don’t approach companies and say ‘Hey, let us do some research on your stuff! For Free!’ It doesn’t happen. People tend to freak out because of who paid for the research to be completed, but here’s the thing: Any company with a product that requires testing or research pays for that testing or research. Organic farms? They paid for that certification. A 5-star safety rating on a vehicle? They paid for that research and testing. A new drug gets released? They paid for the research and testing. That’s how research works folks. Universities and companies agree to research and test things because they GET PAID TO DO IT. But my Uncle’s Dog’s Sister Said Juice Plus is a scam! Last up: The haters. No matter what the product is, it will have haters. Folks will barrage the internet with their opinions of a product, it’s research, and it’s results. Typically they sell something that could be considered a competitor, and instead of offering research on their OWN product (because it has none) they try and convince you that the actual research in front of you is bunk. This is to be expected because that’s how marketing works. However, I encourage you to look at their motives before you believe everything they say. Look at their credentials, what they’re selling, how many ads are littered across their site, etc. Are they more trustworthy to you than M.D. Anderson? Unfortunately, negativity pays more on the internet. Even I am guilty of this! I use negative phrases in my keywords and SEO because it’s what gets the most attention (did ‘Juice Plus Scam’ lead you here? Yeah. I did that.) I have read so many posts from other people talking smack about Juice Plus where everything they say is, quite literally, wrong. It’s like arguing that the sky is green because you never bothered to look up and see the blue. I’m not going to link to any of their ad-infested sites. Nor am I going to give them the time of day in terms of offering a response. My only recommendation here is…. Read the ACTUAL research and make up your own mind if you are having doubts. I’m done now, let’s talk about the good stuff! Phew, ok! Now that that ugliness is behind us, let’s talk about some of the GOOD things! JuicePlus is the most researched nutritional product on the planet. Yes, it’s the real deal. Coming up on 40 (!!) PUBLISHED studies! The number one group of studies that I want to talk about is Bioavailability. What does that mean? I’m so glad you asked! It means that after you ingest Juice Plus it is entering your bloodstream. It’s actually DOING something. If you take a vitamin, and it doesn’t enter your bloodstream, it is doing nothing. Well, nothing aside from annoying your kidneys as they filter it into your urine so you can have expensive pee. Please, if you are taking a vitamin, and it has a published bioavailability study, please link it below. And I mean a study on that specific multivitamin. Not a generic one for Vitamin C.
Now, In the interest of keeping this post at a reasonable length, I have to pick and choose my studies. If you want to see them ALL go here. But next up I want to mention the lung health one. This study showed improvement in the lungs of smokers who didn’t even stop smoking! All they did was add Juice Plus to their diet! If that doesn’t show that this stuff is doing something, then I don’t know what will. The last research topic I’ll mention here today is the Immune System. There are multiple studies regarding Juice Plus and the immune system. They ALL show that JP helps support key measures of immune system function. I’ve done my own ‘clinical research’ here too over the past 3 years. We (My family of 4 ranging from 3-34 years old) don’t really get sick anymore. We used to have ear infections,pneumonia, colds, and viruses galore. Now we get an occasional (like maybe 2x a year if that) bout of sniffles. Did I mention that the immune system research covers ALL age ranges? Because, yeah. How about that. There’s a ton more that I didn’t even mention yet! Heart health, dental health, DNA and Nutrigenomics, Oxidative stress, healthy skin, systemic inflammation, and obesity to name a few. We rarely research the source of the ground beef in our fast food burger, but when it comes to something as simple, safe, and life-changing as Juice Plus we all become Sherlock Holmes for some reason. I’m ok with that because look at what there is to back it up! How awesome is that!